Manu National Park – is one of the biggest protected areas in the world, it covers almost 2000000 hectres (4942088 acres). The park protects several ecological zones ranging from 300 to 4000 meters (984 to 13123 ft) above sea level. Because of this topographical range, it has one of highest levels of plant, insect and animal biodiversity of any park in the world. Manu is the home to the some of the greatest biodiversity and the greatest biomass in the world! Up to 250 varieties of trees have been found in a single hectare! 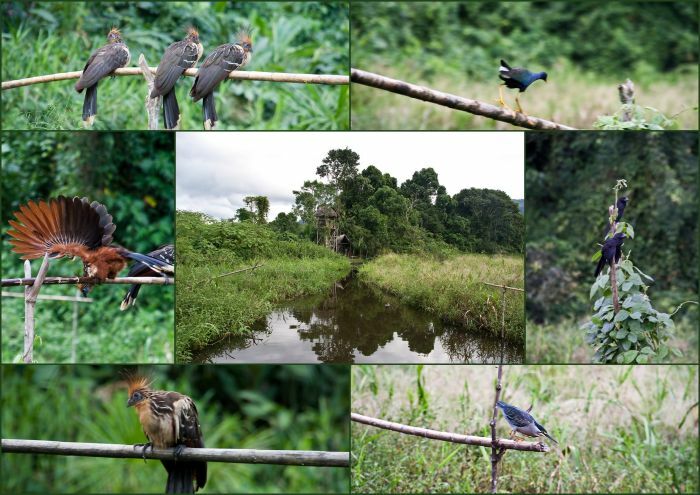 Peru holds the world record for number of bird species seen in a single day without the help of motorized vehicles, with 331 birds at Cocha Cashu in southeast Peru. This record was established by Ted Parker and Scott Robinson in 1982 and yet to be surpassed! 1. “Cultural or buffer zone” covers about 120,000 hectres (300000 acres). It is a beginning of the park and the only zone where tourists can enter unaccompanied. It starts from Madre de Dios River and Andean highlands at the southern boundaries of the national park. In this area there are small villages, settlers and native communities working in productive activities such as agriculture, forestry and cattle breeding. 2. “Reserved zone” covers 257,000 hectres (635000 acres). It is located at the lower part of Manu River and extends from Panagua River to Boca Manu. This area is set aside for controlled scientific research and ecotourism. Although the tourists are permitted here, entry is strictly controlled and visitors must visit the area with an authorized guide. This part of the park has a tremendous diversity of landscape, wildlife and vegetation. The river bends form lagoons with wonderful flora and fauna diversity. 3. “Intangible zone – Manu National Park” is the biggest part of the Park, covering an extension of 1,532,806 hectres (3787000 acres). This part of the park is strictly for flora and fauna preservation and only government sponsored biologists and anthropologists may visit with no right to interfere with natural history of events. The tropical ecological research station Cocha Cashu is located in this part of the Manu Park. In this area tourism is not permitted and entry is with special permit only. The Manu have been inhabited by Indigenous tribes since long ago. There are about 1000 people in these tribes. There are also about 200 Quechua Indians in this part of Manu National Park. According to Guinness Book the tropical forests of Amazonia is a place of the biggest concentration of unexplored tribes. Today there are only about 100 uncontacted tribes in the world. More than half of them live in the tropical region of Amazonia in the territory of Peru and Brazil. It is better to take a bus from Cusco to Shintuya or Atalaya (this will take about 10-12 hrs), then continue by the river to Boca Manu (another 8 hrs) and then another 8 hours until arriving to the area of the park. The second is to arrive by air from Cusco to Boca Manu, but the bus trip is much cheaper and allows to enjoy the nature – it is very beautiful route. If you plan to visit Manu, please note that it is very risky to go to jungles alone, without a guide who knows the routes and will help you avoid dangerous places. Besides, you will not be allowed to visit “Reserved zone” of the Park without a certified guide. You can enjoy the beauty of Manu National Park and learn about flora and fauna with the help of local travel agencies by selecting one of tours offered by them.